We are engaged in fabrication, installation and commissioning of varied oxygen nitrogen plants with cylinder filling system that are available with different capacities that range from 20 m3/hr to 1000 m3/hr. Sourced from ISO certified vendors, we take quality raw materials in order to make our range vital and useful. Our comprehensive range oxygen nitrogen gas plants are highly appreciated for their low maintenance cost, sturdy construction, high efficiency and longevity features. 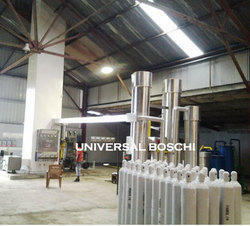 Universal Boschi Oxygen Nitrogen Gas Plants of different capacities ranging from 50 m³/hour to 2‚000 m³/hour. The machines are prompt to install as they are pre-packaged ready to install and do not require any special civil foundation and are simply mounted on the factory floor. They offer both oxygens as well as nitrogen with purity up to 99.7% and 99.99% respectively. Our products do not require much maintenance and require lesser power for the production of gases owing to low-pressure low energy process. Our organization has a pool of talented professionals to inculcate our advanced technology and provide our customers more effective and efficient gas plants. The success and growth achieved by our company are the results of the united efforts put forth by our well educated, experienced and dedicated workforce. Our team of engineers and technicians has more than 30 years of vast experience in the domain of designing‚ developing‚ installation and commissioning of all kinds of plants. Packaging Details: Export Sea Worthy Wooden Packing. The Cylinder Filling Oxygen Nitrogen Plants is a multistage machine, balance opposed oil lubricated, water-cooled heavy duty designed for 24 hours continuous operation, horizontal with rugged inter coolers to give normal discharge conditions. This can be single frame or a primary and secondary compressor. The increased no. of stages improves the volumetric efficiency of the compressor and reduces B.H.P. The interstage temperature are low and therefore no carbon formation. Dry type provided by the air compressor manufacturer. 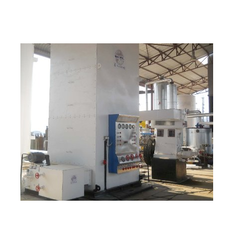 We are leading suppliers & distributors of Liquid Nitrogen Generating Plant. We fabricate technologically advanced Oxygen Generating Plant and supply them worldwide. We not only manufacture and export, but also offer complete commissioning service to our clients. We send our engineers in order to hand over a fully running plants to our customers. Some common features of our oxygen generating plants include low power consuming, excellent performance, reliable and user friendly. 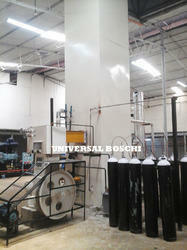 Our Oxygen Nitrogen Gas Plant are designed and manufactured with latest Italian technology. 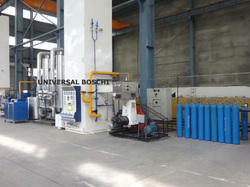 We are leading manufacturer and exporter of Oxygen Nitrogen Gas Plant. 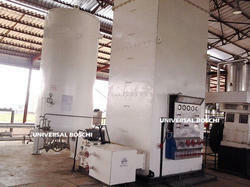 We have manufactured over 500 oxygen nitrogen plant equipments since 1985 in technical collaboration with ING. L A BOSCHI, ITALY over 30 years.